Right Water is a household-focused initiative to help families make greater use of alternative water sources around their home and garden, helping to reduce the use of drinking water supplies for non-drinking purposes. The initiative is aimed at encouraging Victorians to continue using drinking water wisely, while also showing how easy it can be to capture rainwater from the roof to keep your garden green and healthy. We all know to use drinking water wisely and the Permanent Water Saving Rules that apply year round, reinforce good habits formed during the drought – but the lessons should not stop there. The Living Victoria Rebate Program has rebates to install and connect rainwater tanks for use in laundries and flushing toilets. Visit www.depi.vic.gov.au/water/saving-water for details and to apply for a rebate of up to $1,500. The Right Water campaign helps highlight practical initiatives state wide. 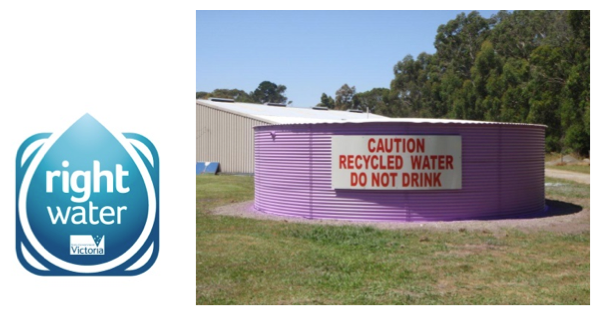 South Gippsland Water has recently assisted in the installation of a new 100,000 litre purple recycled water tank at the Meeniyan Recreation Reserve. This tank will store recycled water for use in irrigating the reserve’s cricket and football playing surface rather than rely on the town’s drinking water supplies. It’s the Right Water for the job. Learn more about using the Right Water for the job at www.rightwater.vic.gov.au.